Aside from C’s teenage vacation hopping around Australia and New Zealand for three weeks, our 19 days at sea with Poseidon Expeditions was the longest either of us had been away from home. New York, we barely missed thee. 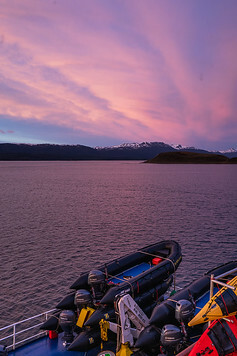 During our 19-day voyage spanning Tierra Del Fuego, Argentina, the Falkland Islands, South Georgia, the South Shetland Islands, and the Antarctic Peninsula, our home away from home was with Poseidon Expeditions aboard the M/V Sea Spirit. 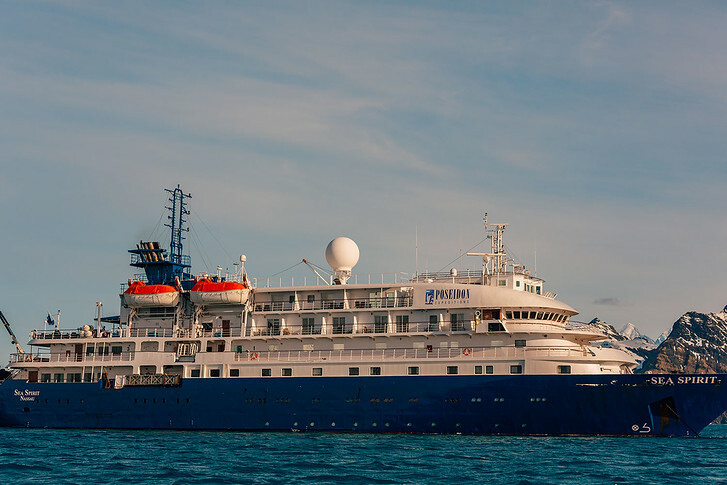 The Sea Spirit is a 297-foot vessel registered in the Bahamas, can travel at speeds up to 15 knots, and can accommodate 114 passengers and 72 crew. 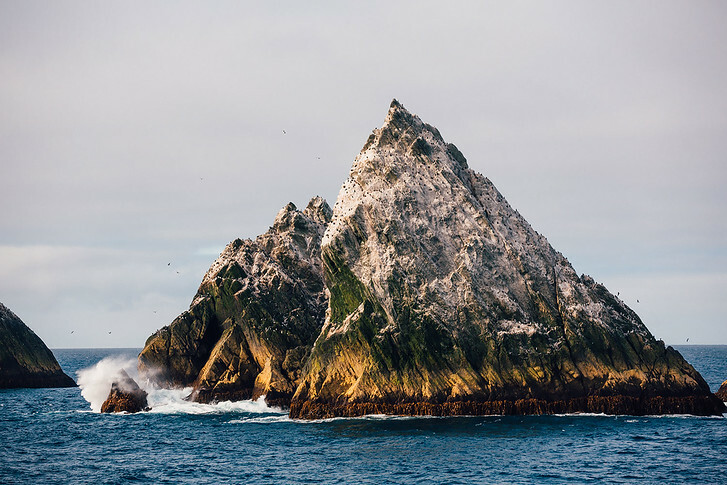 While visiting some of Earth’s most remote territories was the voyage’s indisputable highlight, the Sea Spirit offered plenty to keep us entertained, educated, and comfortable during our days at sea. 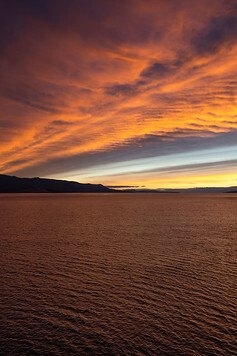 Here’s a look at what you can expect on a cruise with Poseidon Expeditions! 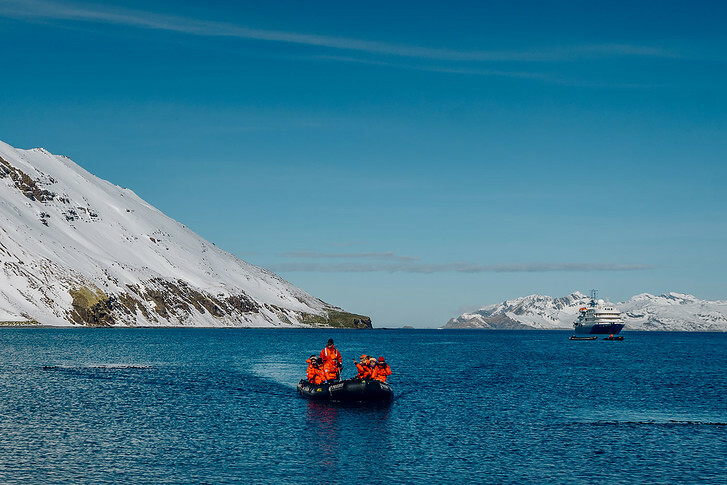 While Antarctic cruises are rugged affairs, make no mistake – the M/V Sea Spirit is a gallantly luxurious vessel. Like us, many guests aboard the Sea Spirit are enthusiastic photographers, ranging from the avid amateur to the prime professional. This is what makes the ample outdoor space on Decks 4 and 5 so incredible. While many cruise ships restrict substantial sections of the deck, Poseidon Expeditions offers a completely public Deck 4 that wraps the entire 360 degrees around the Sea Spirit. 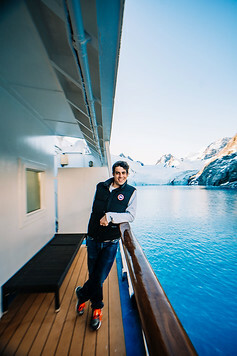 This offers guests an incredible opportunity to take stunning photographs of subjects that will invariably be on the vessel’s bow, stern, port, or starboard! The port and starboard sides of Deck 5 are reserved for private cabin decks, but both the aft and bow feature incredibly spacious decks. The bow features an observatory deck just in front of the bridge, which, also unlike most cruise ships, is completely open to all guests! On the other side, the aft deck features a Jacuzzi (I must say, there is something even more comfortable than usual about a Jacuzzi when it’s freezing outside!) and giant deck space used for photography, group drinks, and the occasional barbecue dinner! 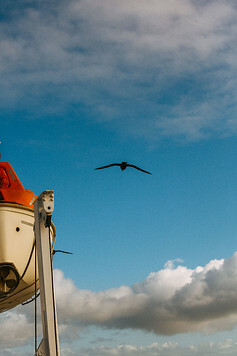 Every time I first board a cruise ship, I always have that “hold your breath” moment. Did the website oversell the cabins? Am I going to be comfortable cooped up here for the next however many days?? 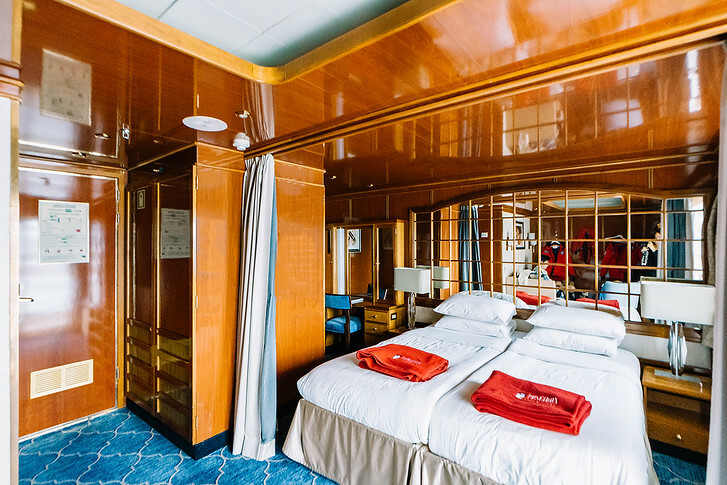 Well, when we first opened our cabin door and noticed our suite was bigger than our Buenos Aires hotel room – which wasn’t too shabby itself – we knew a luxurious voyage lay ahead. After first entering the cabin, the bathroom was directly to our right. 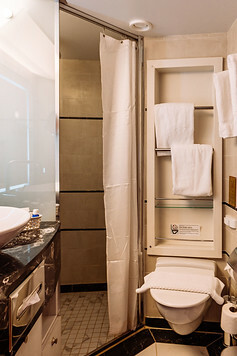 The bathrooms aboard our Poseidon Expeditions ship contained a toilet, wide sink, shelf space below the sink, shower mat, two bath towels, two hand towels, and a shower that featured a rainfall showerhead, shampoo and liquid body wash. Overall, the bathrooms were impressively spacious, so much so that – should you know your cabin-mate well enough (!) 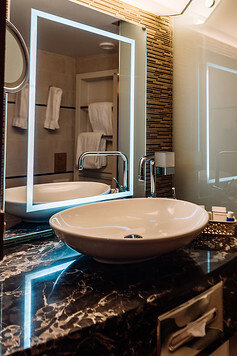 – you can easily manage two people getting ready at the same time. Just left after entering the cabin was a large, double-sided closet that featured a small built-in chest of drawers, hanger space, hangers, and a large shelf stretching across the entire closet’s topside. 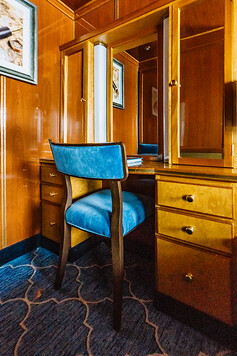 On the other side of the closet were a gorgeous desk, desk chair, and vanity that featured a large central mirror flanked by mirrored cabinets with ample shelf space. While small, this was a perfect place to read or quietly get some work done! Toward the open sea was the bedroom, which contained a queen bed (made of two twins) and two bedside lamps and desks. The linens and pillows were comfortable (perhaps too much so, based on our proclivity for afternoon naps!) and changed daily. Opposite the bedroom (which can be demarcated with adjustable blackout curtains) stood the sitting room, which contained a small coffee table, large sitting chair, couch, and impressive media center. 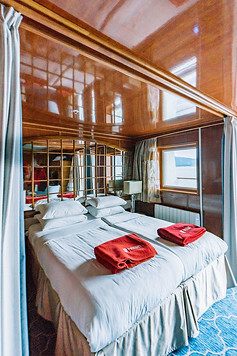 Each cabin on Poseidon Expeditions ships contains a flat-screen television that displays movies, documentaries, and important information such as the daily schedules. Below the television and behind a wood door lies the mini-bar, and both are surrounded by a variety of drawers, glass-door cabinets, and open shelf space. 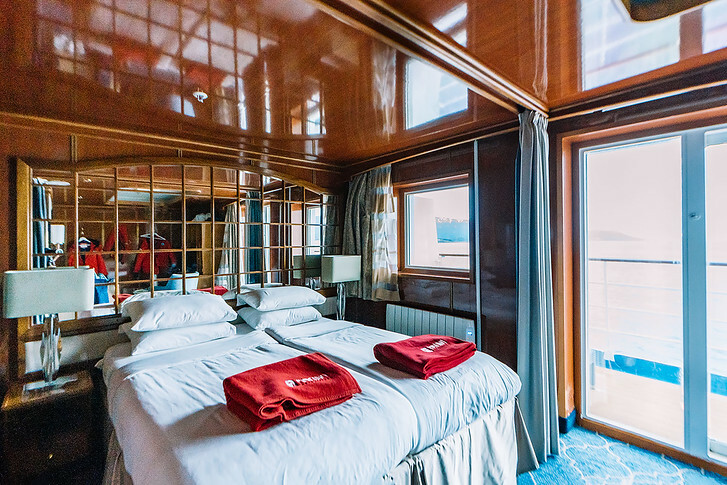 Besides the elegant finishing and surprising space, the most impressive thing about the Poseidon Expeditions cabins are how economically the spaces are designed. C and I literally emptied our suitcases and were able to fit everything we brought – clothes, laptops, multiple cameras, and video equipment – into either the closet or multiple shelf spaces. This shrewd design only made a big space feel even larger! The crown jewel of our cabin, however, was unquestionably our private sundeck. 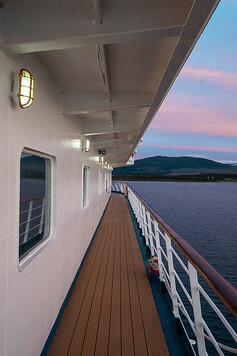 While only available in cabins on Decks 5 or 6, having a sundeck (not to mention the extra space) is worth every penny. Offering a roomy view of the open ocean, our private balcony featured a small table, two deck chairs, and a full-size deck bed. This secluded space is perfect for everything from intimately observing beautiful landmarks to simply unwinding with a glass of wine. 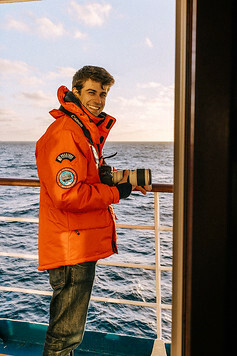 Lastly, as active photographers, our private deck was especially important in capturing unique memories of our Antarctic cruise. While the landings provide everyone an opportunity to immortalize unforgettable moments, our balcony ensured that we were able to record the trip of a lifetime from every angle possible! Now let’s talk about the food. In my experience, cruise ships go to great lengths to avoid hungry guests. 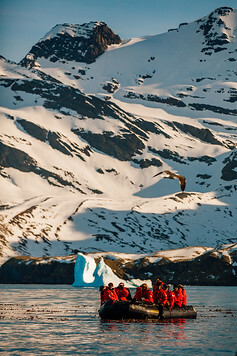 Poseidon Expeditions is no exception. Inside the vessel, Deck 2 features the Sea Spirit restaurant, which serves a buffet breakfast and lunch followed by an à la carte three-course dinner. 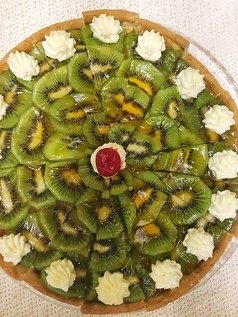 Our fellow passengers were extremely diverse – an incredible 21 nationalities were represented among the 114 guests – and I thought the Sea Spirit catered to this brilliantly in the variety of soups, smoked fish, cold cuts, and hot food that was available during both breakfast and lunch. 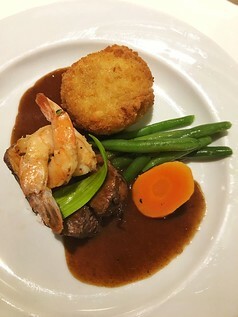 The dinner menu typically featured four options for each of the appetizer, entrée, and dessert courses. 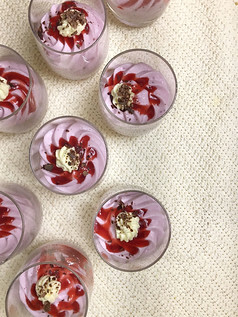 A range of delicious dishes were always on offer along with efficient, friendly service and a menu that catered to vegetarian, vegan, and gluten-free diets. 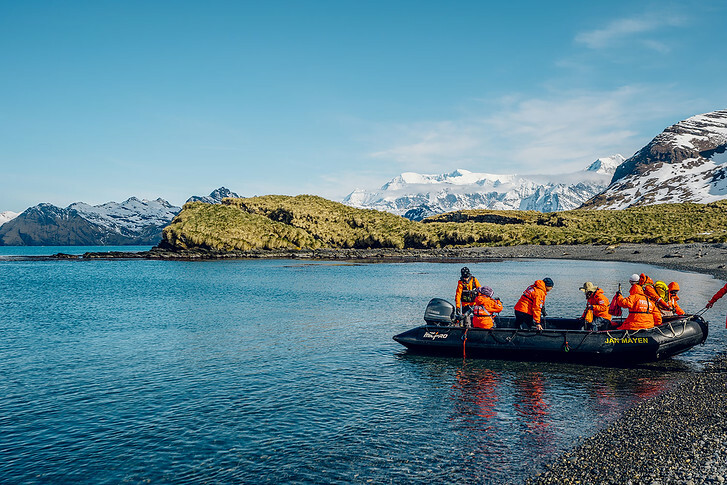 To avoid any doubt that passengers could go hungry, Poseidon Expeditions offers just a few more options to ensure smiling faces and full stomachs. Each day, an “early bird” breakfast is served in the Deck 4 club lounge. 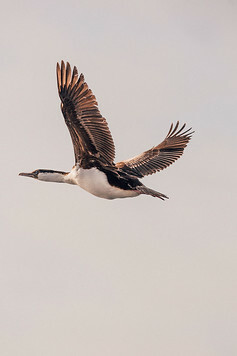 Usually featuring orange juice, coffee, tea, and assorted pastries, pecking at the early bird breakfast doesn’t preclude flying to the buffet breakfast later that morning! And, later each day, “afternoon tea” is served, also in the Deck 4 club lounge. While the name “afternoon tea” naturally presents itself as a light, elegant affair, afternoon tea with Poseidon Expeditions is anything but – much to me and C’s delight! Roast beef sandwiches, cream puffs, chocolate scones, Belgian waffles, and ice cream sundaes were just a sampling of the afternoon tea wares we enjoyed during our Antarctic cruise. 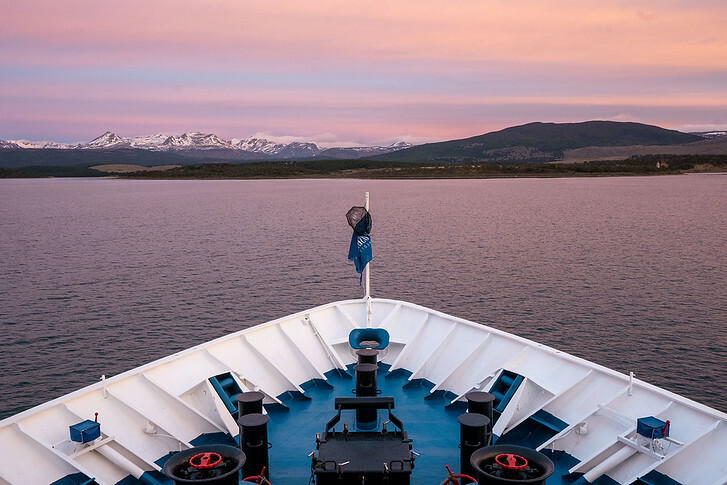 As a result, within mere days of leaving Puerto Madryn, Argentina, I quickly realized gaining 10 pounds – rather than going hungry – was the far greater risk aboard the Sea Spirit. Fortunately, there’s a gym on Deck 5! 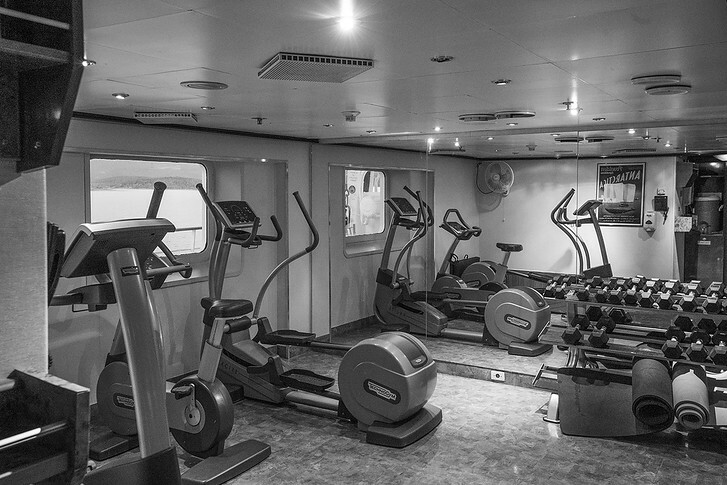 Though modest in size – two elliptical machines, one stationary bike, roughly 40 free weights, two stretching mats, one towel rack, and one water cooler – the Sea Spirit gym is a great way to work off some calories during your Antarctic cruising! The indisputable Sea Spirit social scene lies on Deck 4, in the vessel’s luxurious Club Lounge. The Club offers an espresso machine, tea, and cookies throughout the entire day. With a morning coffee and daily newsletter (featuring headlines from around the world, printed in multiple languages) in tow, it’s common to see other guests starting their day in the Club, eagerly swapping stories and discussing the day that lies ahead. Afternoon tea is also held in the club, where guests can enjoy live music while sitting either on plush chairs or at the bar, where beer, wine, and cocktails (including the famous “Cocktail of the Day”) are served. My in-house liquor consultant, C, has assured me the bar, which features an impressive beer list and top-shelf liquor brands, stands toe-to-toe with any Manhattan ale house. 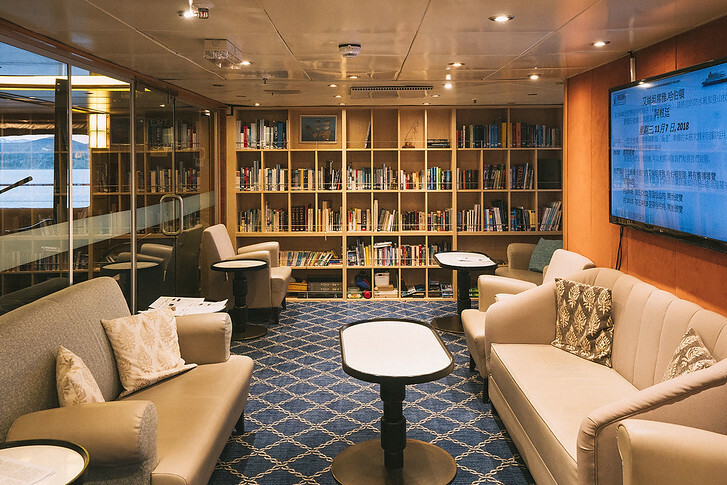 The Club Lounge also features the Polar Library, an impressive collection of Antarctic-themed fiction, nonfiction, and photography that perfectly inspires the explorer’s spirit! 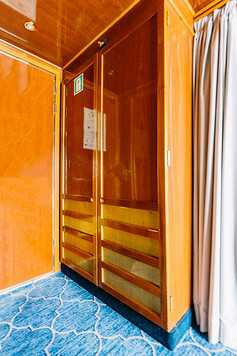 Head down one staircase from the Club, and you’ll find yourself on Deck 3, the information hub of the Sea Spirit. Deck 3 houses the Expedition Desk – a place where you can learn about upcoming lectures, workshops, and landing schedules. 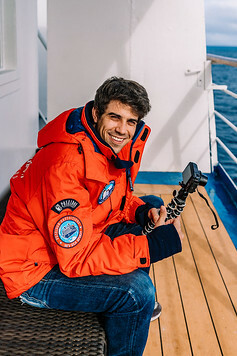 Additionally, you can ask the super friendly and knowledgeable Expedition Team any questions you have about history, geography, or Antarctic wildlife. Finally, Deck 3 also houses the regal Oceanus Lounge. Aside from our cabin, we probably spent the most time on board here, as all lectures, landing briefings, landing recaps, and other group discussions are held among the Lounge’s swank couches and armchairs. How many landings did you do per day? Landings are weather dependent but they made every effort to do 2 landings each day! Some days we did a full landing and some days we did a zodiac cruise. Can you go up on the bridge? Yes! One of the nicest parts of the cruising experience was Poseidon’s open bridge policy. 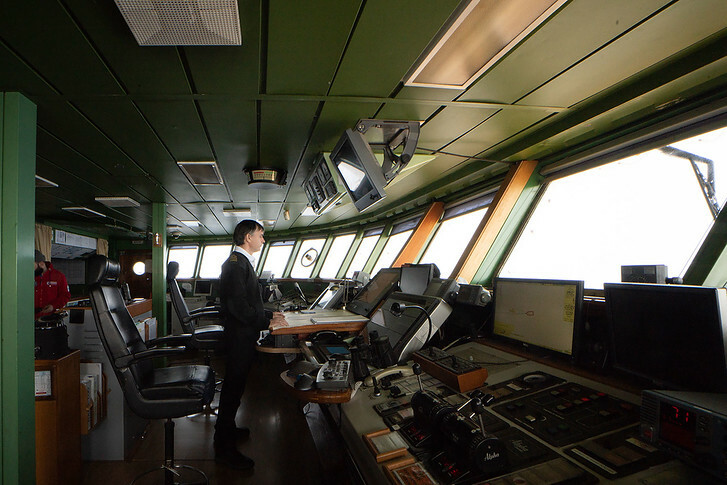 You can go visit the bridge anytime, day or night, and get a nice view from the front of the ship! Are the lectures in English or available in other languages? 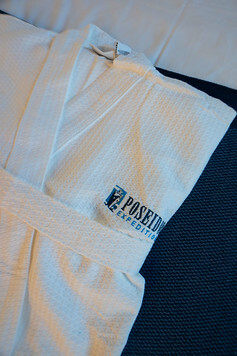 Poseidon organizes each cruise according to the passengers on board. For our cruise, there were Americans, Chinese, Russians, Germans and French so expedition guides were available for each of those languages. The base language is English but translations and activities are conducted separately for the languages as needed. Are you heading to Antarctica? Let us know any questions in the comments below!